Property Location Located in Nashville, Quality Suites Nashville Airport is close to Larry Keeton Theater and Wave Country. This hotel is within the vicinity of Two Rivers Golf Course and Lane Motor Museum.Rooms Make yourself at home in one of the 50 air-conditioned rooms featuring refrigerators and LED televisions. 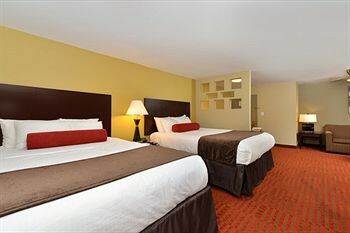 Your room comes with a pillowtop bed, and all rooms are furnished with queen sofa beds. Satellite programming and MP3 docking stations are provided for your entertainment, while complimentary wireless Internet access keeps you connected. Shared bathrooms with hair dryers are provided.Rec, Spa, Premium Amenities Take advantage of recreation opportunities such as a fitness center, or other amenities including complimentary wireless Internet access and gift shops/newsstands. This hotel also features a fireplace in the lobby and a television in the lobby.Dining You can enjoy a meal at a restaurant serving the guests of Quality Suites Nashville Airport, or stop in at a grocery/convenience store. Quench your thirst with your favorite drink at a bar/lounge.Business, Other Amenities Featured amenities include a 24-hour business center, a computer station, and complimentary newspapers in the lobby. A roundtrip airport shuttle is complimentary during limited hours.